Healthy Soup Recipe collection – Soups are healthy, delicious, easily digestible comforting nutritional food for babies, toddlers & kids during the rainy/winter season and when they have a common cold. Soups are even the best to opt when the child is fussy about food or eating vegetables. 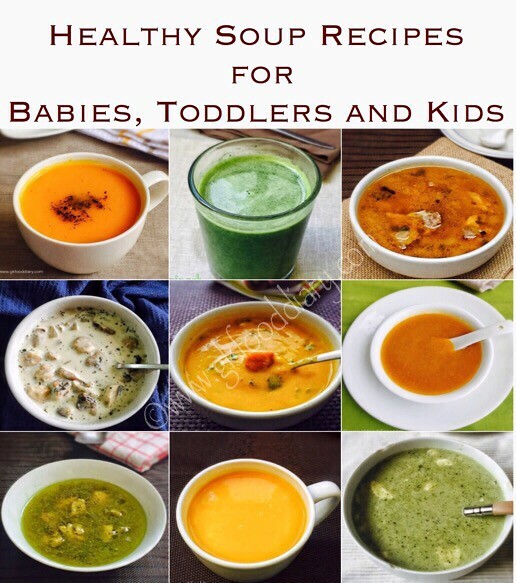 Here are some healthy, easy to make soup recipes for babies, toddlers, and kids. 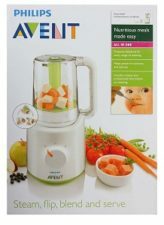 Also, check out our collection of the entire homemade baby food recipes for 6-12 months if interested. Bookmark this page for future reference as I will be updating this post on a regular basis. Click on each thumbnail image given below for the soup recipes. Choose recipes according to your baby’s age which is mentioned in the brackets along with recipe heading. Before making the soups, wash the vegetables and fruits well. Always serve the soups fresh and warm. Better to consume the soups within 1 hour from the preparation. Start with 4-5 tsp and gradually feed more quantity based on baby’s interest and tolerance. Watery soups can be added to baby porridges or cooked rice. Spices can be added to soups after eight months, add one spice at a time when you are introducing which helps to prevent allergic reactions and upset tummies. If the recipe calls for formula milk, make sure to not to boil/cook it. Prepare the soup with water and once the soup is warm, add prepared formula milk. No need to add salt to the soups until your baby turns one year. 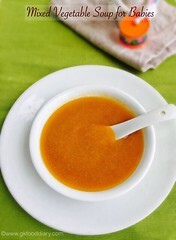 If your baby is allergenic to any ingredient used in the soup recipe, please remove it while preparing. Soups should be preferred occasionally during illness or monsoon/winter seasons To get the baby to adapt to different textures and taste. Make sure to include a variety of foods in their monthly diet other than soups. Rice gruel/rice soup is an easily digestible food for babies, and it is an excellent source of carbohydrates and vitamins. You could also add mashed dal or vegetable stock to this soup for added nutrients. Plain Rice soup is often given when the child is sick or suffering from loose motions as it provides instant energy. Moong dal soup is a staple in many Indian houses holds and suitable for small babies as it’s easily digestible. It’s also a good source of protein, vitamins, and Iron. But some studies suggest that watery moong dal soup (or any very runny liquid) shouldn’t be given to small babies as the baby should get used to different textures of food. 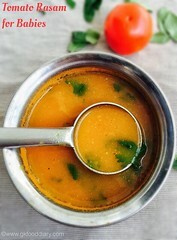 Hence make this moong dal soup thicker and feed your baby wholesome! Barley is loaded with iron, calcium, protein. 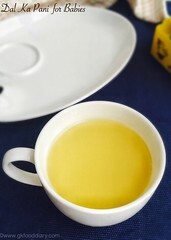 It is best to consume during fever or summer season as its believed to cool the body. Be sure to feed your baby with barely in moderation if your family has no history of allergy to gluten. 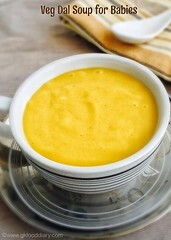 This Vitamin C & Vitamin A soup is the ideal combination of soup with apples and carrots, which has rich nutrients. 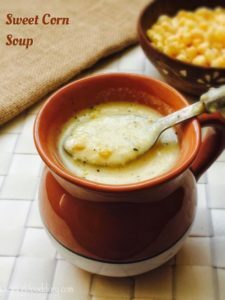 The sweetness of the apple in this soup makes it super tasty and perfectly healthy food for the fussy child. 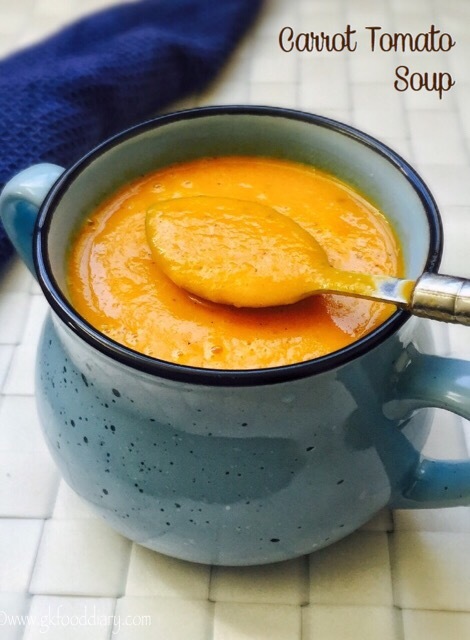 This carrot sweet potato soup is a delicious, creamy soup blended with the goodness of almonds. It’s also a good source of Vitamin A and Vitamin C. The natural sweetness of carrots and sweet potatoes make this soup more tasty as well. 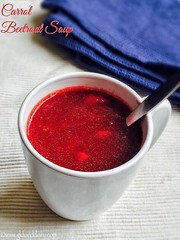 Carrot beetroot soup is a vibrant color soup with a mild sweetness which makes it as the best food for kids. A healthy combination of carrots and beetroots make this soup more nutritious, as beetroot helps in increasing the hemoglobin & carrots are loaded with vitamins which are vital for growing babies and kids. Check out carrot beetroot soup recipe here. This south Indian style tomato soup with mild spices like pepper, garlic, and cumin seeds is the best remedy for cold & cough, also ideal during monsoon/winter season. 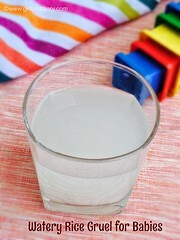 It boosts immunity, helps in digestion and increases the appetite in kids. 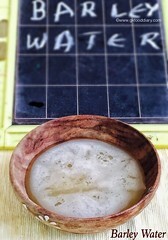 It can be given to kids as soup or mixed with steam cooked rice. This clear chicken soup is the best way to introduce chicken to babies. It’s very nutritious, easily digestible and also helps in treating cold and cough. It’s very easy to make and tastes delicious too. You can also add some vegetables or corn kernels to make the chicken soup tastier and filling. 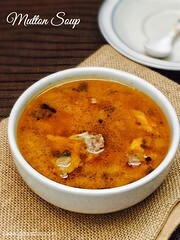 Mutton soup is another healthy comforting soup for kids when they are down with cold/flu. It helps in clearing stuffy nose and throat infection. Also, this nourishing soup is ideal when you introduce mutton to your baby for the first time. Mixed vegetable soup is a healthy wholesome soup made with assorted vegetables, onions, and tomatoes. 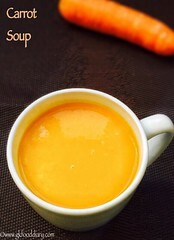 This tasty soup is the best way to include more vegetables in fussy eaters diet. Prefer this as a clear soup (after straining) when kids are down with an illness. Vegetables lentil soup is a super healthy, thick and creamy soup, made with a healthy combination of vegetables and lentils/dhals. It can be even served as a main meal for kids as it’s very filling and wholesome. Any seasonal vegetables of your choice can be added to this soup. 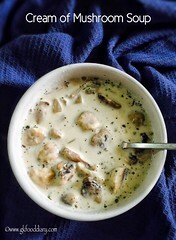 Cream of mushroom soup is a heartwarming soup and best suited for winters. Mushrooms being great immunity boosters, if given during cold and cough in children, it boosts up energy and helps to fight the disease. Broccoli soup is prepared with broccoli, potatoes, milk and fresh cream/cheese as the main ingredients. This broccoli is soup is super creamy, tasty and healthy too. It’s one of the best ways to include broccoli in kids diet. This broccoli soup can also be prepared with breast milk or formula milk (instead of cows milk) for babies below one year. Tasty, healthy and non-dairy soup made with fresh spinach leaves and mild spices. 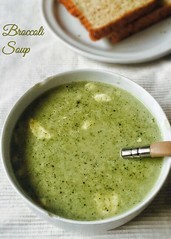 This spinach soup is an ideal choice when you introduce spinach to your baby for the first time. It’s very easy to make but tastes so good. 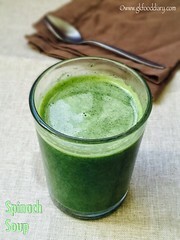 Spinach soup is also recommended for pregnant women and lactating moms. 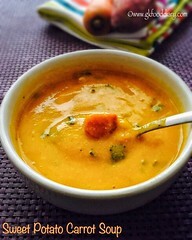 Carrot soup is a mildly sweet and spiced, rich, creamy soup without the addition of milk/cream. The soup is so easy to make but absolutely delicious. 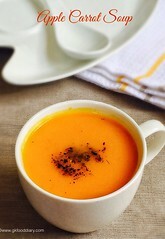 The bright orange color of this carrot soup is surely appealing to kids! A mildly spiced, tangy, silky smooth and creamy tomato soup is a perfect choice for kids during rainy seasons and winters. The addition of fresh cream to this soup makes it more tasty. This Creamy tomato soup is a sure winner among kids! Easy, quick and healthy soup with the goodness of carrots and tomatoes. 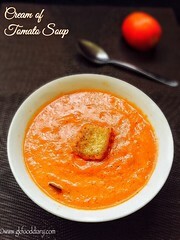 It’s a delicious soup flavored with a mild sweetness from the carrots &amp; slight sourness from the tomatoes. 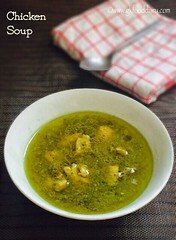 This soup also helps in fighting common cold and cough. 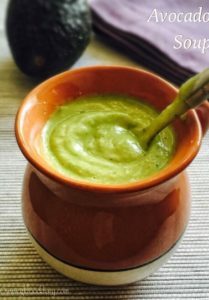 Easy, creamy and healthy soup with avocados. Must try soup for kids who dont like avocado. 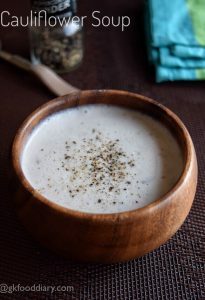 Healthy, creamy, cauliflower soup with nuts, pepper powder and onions for babies, toddlers and kids. Cauliflower tastes best when combined with nuts and loved by kids because of its creamy texture. Make sure you have introduced each food separate and checked for allergies before trying any soup recipe. Always check with your pediatrician before giving any food. Avoid salt and any kind of sugar at least till one year. Adjust spices according to your child’s tolerance level.